Thomas Howard was the eldest son of Thomas Howard, 2nd Duke of Norfolk, and of Elizabeth Tilney. He was the brother of Elizabeth Boleyn (née Howard) and so was uncle to Anne Boleyn. Howard’s father and grandfather had fought on Richard III’s side at the Battle of Bosworth but Howard was able to work his way back into royal favour by fighting for the Crown against both the Cornish rebels and the Scots in 1497. He was made a Knight of the Garter in 1510, was created Earl of Surrey in 1514 and succeeded his father as Duke of Norfolk in 1524. In September 1514 he was prominent in leading the English army in defeating the Scots at the Battle of Flodden. In the 1520s, he clashed with Cardinal Wolsey over foreign policy – he preferred war and Wolsey preferred diplomacy – and was involved with the Duke of Suffolk’s and the Boleyn family’s push for Wolsey to be removed from power. In the 1530s, Norfolk carried out diplomatic missions and advised the King on the situation in Ireland. As Lord Steward of England, he presided over the trials of Anne and George Boleyn, his niece and nephew in May 1536. After acting as Lord Steward at the trials of Anne and George Boleyn, Norfolk went on to be godfather to Edward VI at his christening in October 1537 and a commissioner at Queen Jane Seymour’s funeral in November 1537. 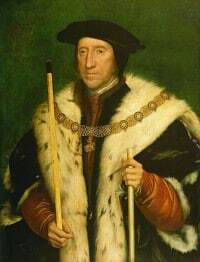 In 1539, he was chosen to go with the Duke of Suffolk to meet Anne of Cleves at her arrival at Dover. In 1540, during Cromwell’s arrest in the council chamber, it was said that Norfolk tore the St George from around Cromwell’s neck; certainly, he was very much involved in the plot against Cromwell. When the King’s anger turned on the Howard family after Catherine Howard’s adultery, Norfolk was fortunate in escaping punishment. He went on to serve the King in the war against the Scots in 1542 but his pro-French stance caused him problems when the King became keen to go to war with France. He served the King in France as lieutenant-general of the army, besieging Montreuil, but was rebuked by the King when he withdrew. On 12th December 1546, Norfolk and his son, Henry Howard, Earl of Surrey, were arrested and imprisoned in the Tower of London after it was alleged that Surrey had displayed the royal arms and insignia in his own heraldry. Surrey was found guilty of treason on 13th January 1547 at a common inquest at Guildhall and Norfolk was attainted on 27th January. Both were sentenced to death and Surrey was executed on 19th January 1547. Norfolk was lucky; the King died before the former’s scheduled execution date. As a consequence, in 1553, Norfolk was released and pardoned by Mary I, and died naturally at Kenninghall on 25th August 1554. He was laid to rest in St Michael’s Church, Framlingham. Taken from The Fall of Anne Boleyn: A Countdown by Claire Ridgway. Mary I pardoned him, even after his involvement with the Boleyns, which led to the downfall of her mother, Katharine of Aragon? He must have done some serious repentance to gain THAT forgiveness. Thomas Howard was a ruthless man – he helped promote, then destroy, the two nieces he dangled before Henry VIII, all for power that eventually cost him the life of his own son. I don’t know, judging by what is known of him, if I could consider him a great person. Certainly, he had mixed success as a member of the King’s inner circle, but he was way too willing to sacrifice family, and destroy anyone who got in his way. He was a lucky rogue. Cruel and heartless, but cunning and lucky. A pity of a man, I would say. Well said: ” a pity of aman”.